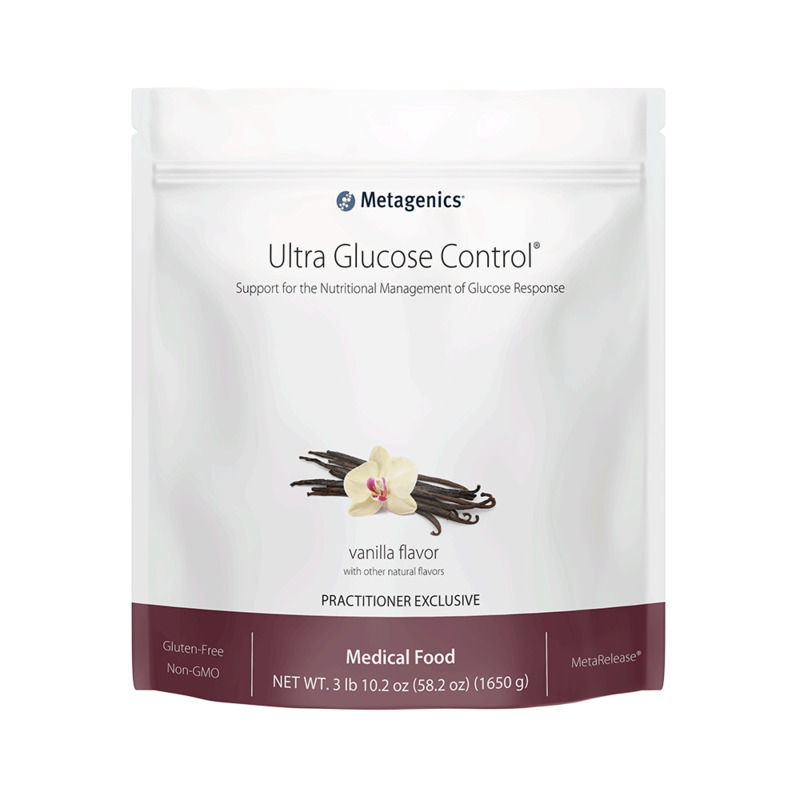 Ultra Glucose Control - 30 Servings | Additional 5% Discount at Checkout + Free Shipping in the Continental U.S. Flavors: Chocolate or Vanilla Recommendations: Take one serving one to two times daily, or as directed by your healthcare practitioner. Blend, shake, or briskly stir about 2 level scoops of Ultra Glucose Control (55 grams) into 10-12 fluid ounces of chilled water. Consume within 10 minutes of reconstitution. Other Ingredients: Heat-moisture treated amylopectin, pea protein isolate, sunflower oil, natural flavors, rice protein concentrate, erythritol, isomalto-oligosaccharide, magnesium glycinate, organic cane sugar, silica, L-leucine, Chinese cinnamon bark powder, guar gum, L-isoleucine, L-valine, xanthan gum, zinc gluconate, rebaudioside A (from Stevia rebaudiana leaf extract), ascorbic acid, manganese gluconate, d-alpha tocopheryl acetate, copper gluconate, D-biotin, retinyl palmitate, niacinamide, cholecalciferol, d-calcium pantothenate, chromium picolinate, pyridoxine HCl, riboflavin, potassium iodide, thiamin HCl, calcium L-5-methyltetrahydrofolate, selenomethionine, and methylcobalamin.Directions: Take one serving one to two times daily, or as directed by your healthcare practitioner. Blend, shake, or briskly stir about 2 level scoops of Ultra Glucose Control (56 grams) into 10-12 fluid ounces of chilled water. Consume within 10 minutes of reconstitution. Warning: If you are taking blood sugar lowering medication, dosages may need to bealtered when using this product. Please discuss this with your healthcare practitioner. This product has not been tested in pregnant or nursing women. As UCAN SuperStarchTM, which is a trademark of the UCAN Company.